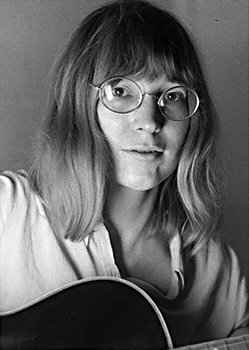 The first time I heard Jo Ann Kelly sing was on a radio programme presented by Alexis Korner some time in the middle sixties. She sang Jimmy and Mama Yancey's 'Make Me A Pallet On The Floor', backed by Bob Hall on piano. Not unnaturally when listening to a radio show, I formed a mental picture of the lady with such an amazingly big blues voice this had to be a big, fat, middle aged woman who wore dresses that resembled tents because nothing else would fit her. How wrong I was and little did I know at that time, listening to my parents' big old valve radio back home in a little Yorkshire village, that I would eventually get to see and hear this wonderful blues singer many times in many settings. Even less did I realise that Jo Ann Kelly would eventually become a personal friend. I heard Jo again on Mike Raven's R&B show during the late sixties and then some college friends bought a compilation of British country blues artists called 'Me And The Devil' which featured Jo's photograph on the sleeve. Shortly after, we went to see her play in Bradford and for the first of many times to come, experienced that voice, live. For some unknown reason, I still remember that she wore a smart, grey outfit maybe because the gig represented such a milestone to me as a blues fan. In 1969 I travelled with the same college friends to London (quite an expedition) to see Mississippi Fred McDowell play at the Mayfair Theatre, and Jo Ann was on the same bill. The highlight of that show was certainly the duet between Fred and Jo, 'When I Lay My Burden Down', which was to appear much later on record when Red Lightnin' put out an album of Fred's performance. The track has also subsequently appeared on the Connoisseur compilation of Jo Ann's work which was released last year. I think this is one of the finest examples of her recorded work and, in itself, well worth the cost of the album. Then in the early seventies, I moved to London and was able to see Jo Ann live quite often, at various venues. 1 was a regular at the Sunday afternoon sessions at Ken Colyer's Club Studio 54 in Great Newport Street and got to know Jo Ann, her brother Dave Kelly, Sam Mitchell, Steve Rye and many others. I also took great delight in going to Les Cousins in Greek Street. I'd get there early so I could sit in the front row and nearly get knocked off my chair by her superb voice which had no need for PA. I also remember going to a pub somewhere in North London to see Jo Ann play with her band Spare Rib, which featured founder member of Stealers Wheel, Roger Brown, (with whom Jo Ann collaborated on some songwriting), and Adrian 'Putty' Pietryga on lead guitar. Shortly after this I left London, firstly for Canterbury and then to the little Sussex town of Rye, where I still live. After the relatively short lived electric band, Jo Ann teamed up with Pete Emery and I was able to keep up my connections with the blues scene by giving them bookings down in Rye. On one occasion, Jo and Pete were due to play a gig as part of the Rye Festival. They drove from Cornwall and didn't get here until about 10.30pm. In spite of their fatigue, they went on stage and played a fine set. During the eighties they came to play in Rye more frequently, becoming favourites of the landlord of the then best music pub in the area, as well as the regular crowd. It was in this relaxed atmosphere that Jo Ann chose to play her first gig after recovering from the operation to remove a brain tumour two years ago. In spite of the severity of the illness and seriousness of the operation, that famous voice was not diminished and she sang and played the guitar as well as ever. For me, one of the highlights was Jo singing 'Come On In My Kitchen', backed by Roger Hubbard on slide guitar. She couldn't remember all the words but that didn't matter we were hearing a superb rendition of Delta blues. The last gig she played down this way was at the Hastings Festival of the Natural World last summer. Apart from her own set, she also joined ohn Pearson to add her distinctive vocals to 'Jesus On The Mainline', which must stick in the memories of all those who listened. When Jo Ann Kelly died on 21st October, we lost one of the finest blues singers who ever trod this earth and my family and I lost a good friend. The highlights of her career have been fairly well documented in this magazine and others. But, sadly, she had to be dead before getting coverage in the national quality press; even The Times ran an obituary. We are mostly familiar with stories of how she shunned the big time, such as offers from Canned Heat and Johnny Winter, but there is something else I want to mention. Her willingness to help other musicians, especially blues musicians. Kevin Brown has told me that when he first arrived in London, from Lancashire, in the early seventies, Jo Ann was one of the few people who went out of their way to be of assistance to him. She was also instrumental in getting Nick Perls to record Roger Hubbard and other British bluesers and I saw her digging out names and addresses for John Pearson. This was, of course, part of her down to earth openness, kindness and honesty. She will be greatly missed in many quarters, both as an outstanding blues singer and as a person. Although none of her recordings can, in my view, match the live experience of hearing her sing, we should be grateful for them now that she is gone . The first time l saw Jo Ann Kelly perform was in 1968 at the Blues House, Elephant and Castle, the next the Onslow, Southampton, August 1989. It was as if time had stood still. A sole figure, almost dwarfed by a 12 string guitar, sitting on stage belting out “When The Levee Breaks" for an enraptured audience circled around tables and shrouded in a haze of cigarette smoke. Her untimely death at the age of 45, the eventual result of a brain tumour she suffered two years ago, came as a personal shock. Rather than retread her life and times, there'll be sufficient of that elsewhere, I thought I'd recount an episode in 1970 that for me was the essence of Jo Ann Kelly, person and musician. At the time I was contributing to the alternative music weekly, Strange Days, a cross between NME, OZ and Time Out. The editor's girlfriend had seen Jo Ann at Bunjies coffee bar off the Charing Cross Road and insisted that he run a feature on her. An interview was arranged to take place at my basement flat in south London. On arrival she glanced at my records and books remarked "this will be the first time in months that I won't need to explain names like Memphis Minnie or Fred McDowell", promptly handed me her "press kit" and that was the interview. She was more concerned to talk about music and musicians than about herself. The remainder of the afternoon was spent playing and talking books and records, with Jo Ann trying to convince me of the merits of Peter Maxwell Davis (some hope, I was a musical bigot) and the reasons for the album, "Blues Fell This Morning", being more significant than all others I possessed. My article never saw the light of day because the paper folded but over the next four years we kept in contact, occasionally meeting in the White Lion pub near Denmark Street, now a wine bar (what else? ), with Jo Ann still attempting to broaden my musical horizons, by dragging me along to see bands like Kokomo, The Rumour etc. A lost cause I'm afraid because I was still the musical bigot. It is regularly commented that "British Blues" is a contradiction in terms. This is neither the time nor place to embark upon a debate but Jo Ann Kelly was one of those British musicians who managed to break through middle-class, suburban niceties to find a response within herself to the blues of Black America. From our brief friendship she impressed me that she was musician enough to realise not only that some types of music can really communicate at depth, but also that influences can't be shed and will always be the bedrock of the music one plays. At the gig I attended in Southampton we spoke between sets and whilst not recognising me (after 15 years even I would be pushed to recognise me) upon introducing myself she responded with "You lived in Charlie Gillett's basement flat surrounded by lots of books and records". I could be remembered for less but Jo Ann Kelly's testimonial will undoubtedly be the sensitivity and understanding which she brought to her interpretation of the blues.